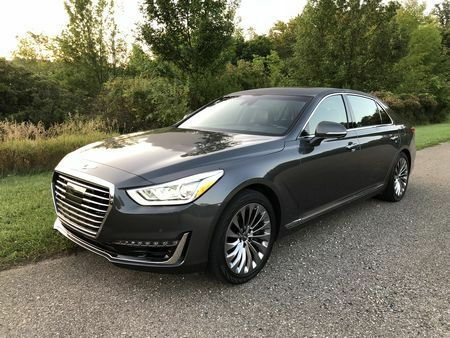 Entering its second model year, the G90 is the full-size luxury sedan flagship of Hyundai's premium Genesis brand, which was established in November, 2015. Compared to the established European brands –BMW, Audi, and Mercedes-Benz - the G90 places less emphasis on performance and, instead, offers occupants a soft, coddling ride and the ability to eat up miles of open roads without the slightest disturbance. With a size that, in and of itself, manages to command respect, the G90's design is a study in understated luxury - flying under the radar behind a badge that often compels passers-by to ask, "What's that?" 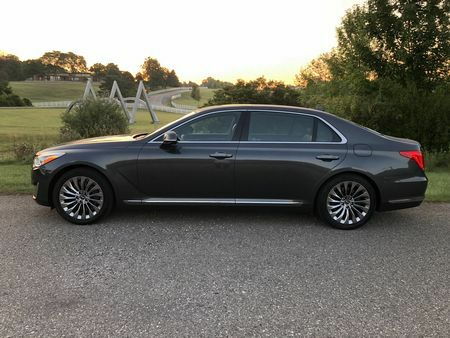 It also hides a nearly two-and-a-half ton girth relatively well, beginning with an understated front fascia that displays the largest iteration yet of Hyundai's corporate "cascading grille." Along the sides, a deeply scalloped upper character line begins at the upper edge of the grille, continues along the hood, and traces a line a few inches below the beltline until it terminates at the leading point of the taillight housings. 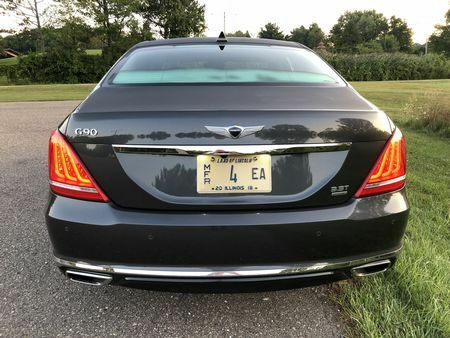 The rear fascia is equally restrained with a large Genesis badge and two chrome strips – one just above the license plate surround, and a lower one that wraps around the lower portion of the bumper just above twin chrome-framed trapezoidal exhaust outlets. All-in-all, it's a handsome – though somewhat bland – design. That stately, understated exterior surrounds a spacious (113.2 cu ft) interior that's elegant, serene, and worthy of luxury car status, with an abundance of features that are packed into it at no extra cost. The electroluminescent gauges in front of the driver as well as the various buttons and knobs are clear, easy to read and within easy reach. 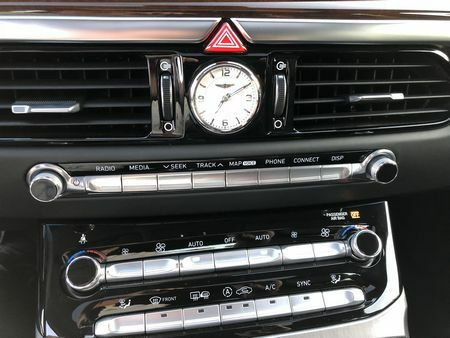 In addition to a remote knob, there are redundant buttons for the primary menu functions – making the infotainment system easy for even the most technology-averse. Considering the high cowl and beltline, views out the front and sides are excellent. 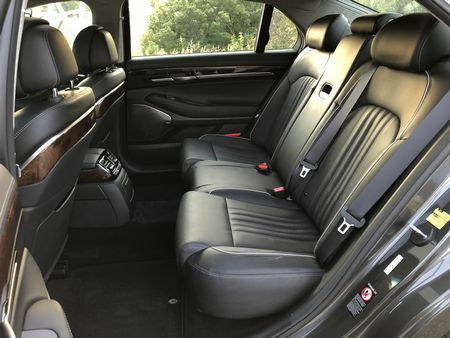 At the same time, thick C-pillars and a high trunk make viewing out the rear three quarters and back difficult, the interior is offered in only two color choices – black and beige, the rear seat doesn't fold – a feature that's standard even on the lowly Hyundai Accent and limits the G90's versatility. 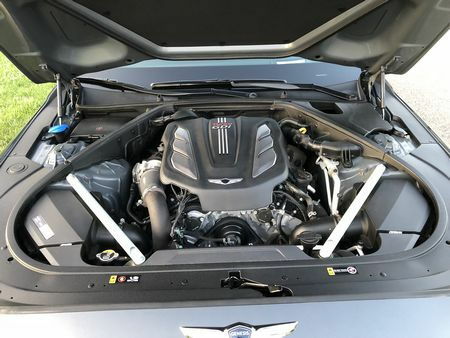 G90 buyers are offered the choice of two engines: a 3.3-liter twin-turbocharged V6 with 365 horsepower and 376 pound-feet of torque, or a 5.0-liter V8 generating 420 hp and 383 lb-ft of torque. Both are good, but the V6 is the better choice. The V8 features a nice engine note, but the G90 isn't equipped to take advantage of that power, while the sensation of acceleration – given the V8's extra weight - is largely the same as that of the V6. Models like our G90 3.3T Premium tester are rated at an EPA-estimated 17 miles per gallon in the city, 24 on the highway, and 22 combined, while our own observed fuel economy was 19.6 miles per gallon in a mix of city and highway driving. Even the most affordable model comes with a full suite of advanced driver assistance features, an adaptive suspension, adaptive automatic LED headlights, head-up driving display, and a 360 degree surround-view camera. 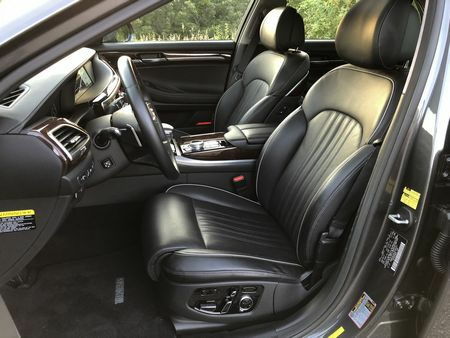 All models also feature wood accent trim, spectacularly comfortable Nappa leather seats that are heated, ventilated, and adjustable 22 ways for the driver and 16 ways for the front passenger. 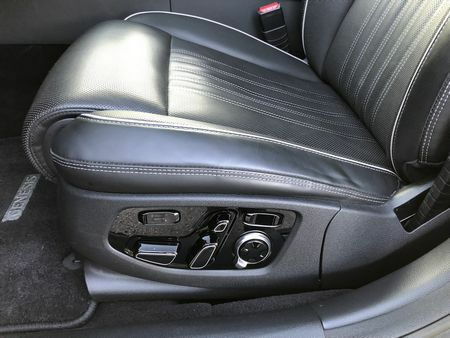 And even though the heated rear seat is optimized for outboard passengers, there's plenty of room for a third in the middle. 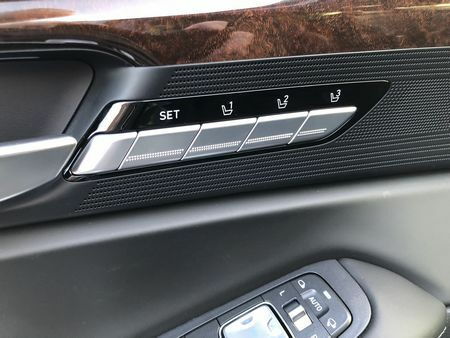 But the luxury touches don't end there as a suede headliner, power door closures, acoustic laminated windows,900-watt Lexicon sound system, Qi wireless device charging, power rear side window sunshades, power rear window sunshade, and three-zone automatic climate control are also standard. In addition, more than a few of the aforementioned items would be considered optional in other luxury sedans - dramatically increasing their prices. 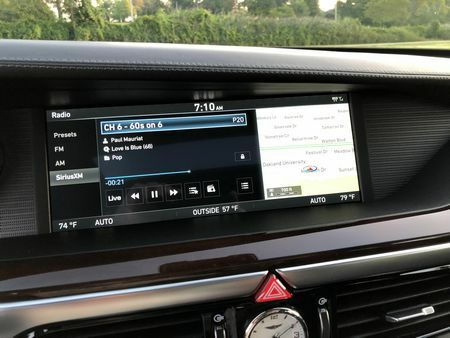 The G90 also comes equipped with Genesis Connected Services that includes such features as remote start, point of interest search and download, voice text messaging, location sharing, geo fencing and enhanced roadside assistance. 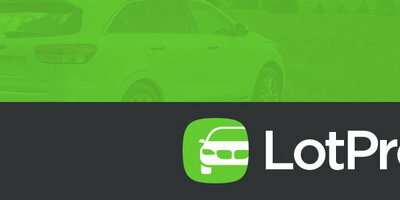 Standard safety features include a multi-view camera, forward-view cornering camera, blind spot detection, rear cross-traffic alert, lane change assist, automatic emergency braking, adaptive cruise control with start/stop functionality, front and rear parking sensors, land departure warning, lane keep assist, haptic steering wheel, and driver attention alert. 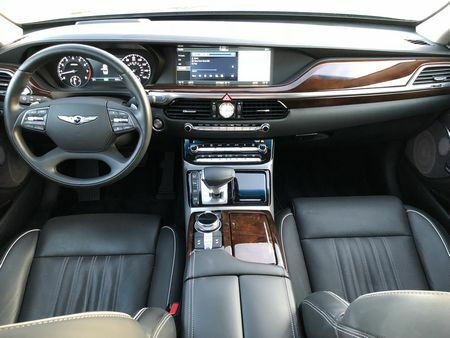 In addition to the bigger engine, passengers in the rear seat of the Genesis 5.0 Ultimate receive the royal treatment with an entertainment system comprised of dual 10.3-inch HD monitors, ventilated seats, memory outboard seats that are powered (14-way right, 12-way left, both with recline), power head restraints, and dual illuminated vanity mirrors. All-wheel-drive is optional on both models. 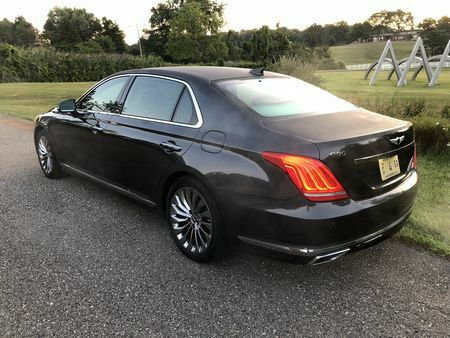 More all-American luxo-barge than sports sedan, the G90's performance is all about the ride. Contemporary luxury sedans attempt to be both sporty and comfortable -largely because of market demands. 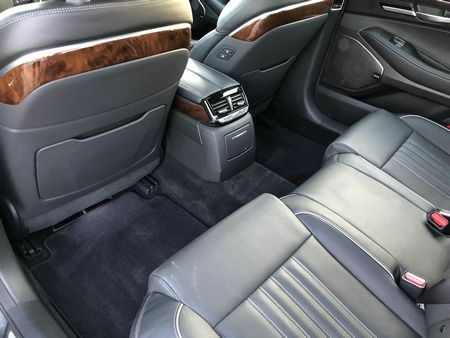 Those two qualities, however, are often at odds, and, by emphasizing performance, many luxury sedans have lost the ability to cosset and insulate occupants from the outside world. This is hardly the case with the G90, where a luxurious and comfortable ride has been prioritized. 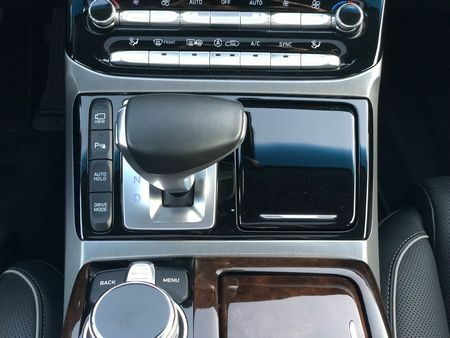 The adaptive suspension offers three driving modes, Comfort, Comfort Plus, and Sport, but don't be fooled: the Sport setting is still pillowy soft compared to sport sedans from Germany and Detroit. The supple, high-tech suspension, smooth V6, and slick-shifting eight-speed automatic come together to produce a refined highway cruiser with excellent merging and passing response, and capable of eating up mile after highway mile while soaking up the harshest road surfaces with ease. The interior is also exceptionally quiet – even at freeway speeds. Engineers used everything from sound-absorbing materials to a low-noise fuel pump, while special attention was paid to mid-to high-frequency noise reduction. At the same time, overly light steering makes the G90 feel out of its element on curvy back roads, where body lean is all too evident. At the same time, the V8 offers only a hint of additional response when compared to the smaller –but lighter – V6. 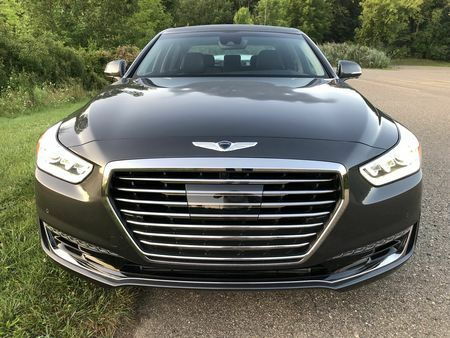 2018 Genesis G90 mono-spec pricing starts at $69,325 for a rear-wheel-drive 3.3T Premium, and tops out at $75,325 for an all-wheel-drive 5.0 Ultimate model. Our Himalayan Gray AWD 3.3T Premium tester came with an MSRP of $71,825, including a $975 destination charge – reflecting the $2,500 upcharge for the HTRAC all-wheel-drive system. There’s a lot to like about the 2018 Genesis G90. Despite sacrificing performance, it brings back the joy of old-school luxury and represents smart choice for those who just want a luxurious experience. With a great set of standard features, straightforward pricing, and the ability to isolate occupants from the harsh realities of the road, the G90 is every bit as luxurious as competitors, but manages to do so with a much more modest price tag.